Q: The first supertournament of the year is behind us. What are your impressions, and how do you evaluate your result? A: Supertournament in Wijk aan Zee is traditionally one of the strongest tournaments of the year, which this time gathered a very strong composition. I think that I didn’t play bad, but on the course of the tournament I was totally unlucky. Q: Despite a fairly high overall standing, there is this feeling that you dropped some points? A: According to the positions in my games, I was obliged to score a full point, well at least half a point higher than the result obtained. The result of this unbearable waste of points was that my score in the end was insufficient for the place. Q: The only defeat in this tournament you have suffered at the hands of Loek van Wely, the principal opponent in the Kings Indian Defence. What has been the case. One has the impression that Loek was able to find an antidote against the opening with which you induce fear in all players? A: Dutch grandmaster Loek van Wely is one of the biggest specialists for the White side of the Bayonet attack in Kings Indian Defence. We have an ongoing principled theoretical discussion in this structure. I also won a several interesting games against Loek in this opening. So the battle continues! Q: Is it possible to argue that this setback deprived you from sharing first place, along with Karjakin, just like that sole undeserved defeat against Inarkiev in Elista prevented you from taking clear first place? 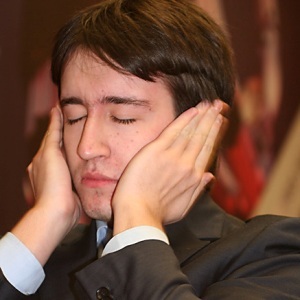 That is already a second tournament in the row, that one single misfire deprives you of apparent victories? A: I wouldn’t say that defeat against van Wely cost me the first place. But I didn’t score against Smeets in a completely winning position. The arbiters have ruled a draw. Q: Now that you mentioned Smeets, what actually happened in that game, where you had a clear advantage in the key moment? A: The situation was like this. In a huge mutual zeitnot, Smeets sets his piece badly (the Bishop was standing between e8 and e7), I am making a move with my Rook, accidentally touching upon his Bishop and the piece fells. According to the rules, Smeets had to stop the clock and call an arbiter to clarify the situation. Smeets reacted immediately and demanded that I should correct the piece on the expense of my time. But the rules are prohibiting to talk to the opponent during the play. Unfortunately, FIDE rules are not very clear on this issue. I run out of time (after Smeets pressed my clock back and talked) in a totally winning position. The judges decided to proclaim a draw in a controversial situation. I can understand Smeets, this was an extreme emotional reaction in a very nervous situation. But in the end I did not get the crucial point for the victory. Q: What can be done to avoid similar problematic situations in zeitnot? A: Let me think about it (smiles – Author). Q: Had this game caused psychological effects? We had an impression that this event left you angry, and you defeated Wang Yue. A: Yes, to put it mildly, I was not in the mood after this game. But the weekend was coming, and I concentrated on preparation for the Chinese Grandmaster Wang Yue. It is very difficult to play him with Black. He does not allow his opponents to develop counterplay and he exerts “strangulation” style very effectively. But nevertheless, I managed to outplay him. Q: Karjakin’s victory was unexpected for you? A: Before the start I did not consider him to be one of the main candidates to win the tournament in Wijk aan Zee. 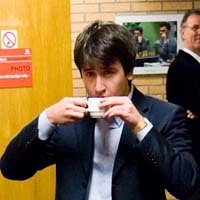 But during the tournament, Karjakin got himself involved in many high-risk positions, when all three possible results (win or defeat or a draw) were at the table, and in the end he had succeeded. So it is normal that Sergey won this supertournament. Q: Your next competition will be Linares. Do you have the final list of participants? As far as I know, the world champion Vishy Anand, Vassily Ivanchuk, Magnus Carlsen and Levon Aronian are set to play. What are the expectations for this tournament? A: In addition to the players that you mentioned, we will have Alexander Grischuk (Russia), Lenier Dominguez (Cuba) and Wang Yue (China). This is traditionally the strongest tournament of the year. What are the expectations? So far, none. Well, in Linares I will try, as in all other tournaments, to play for the best possible result.